The Miami Dolphins free agency period will be rife with crucial decisions, none more important than whether or not to keep wide receiver Kenny Stills. The NFL’s free agency period is just a few short weeks away, and a lot of really good players have already received their walking papers. The choices made during the Miami Dolphins free agency period could make, or break, this young franchise. 2016 saw this team take a few giant steps forward, and free agency leaves them with a lot of big decisions. 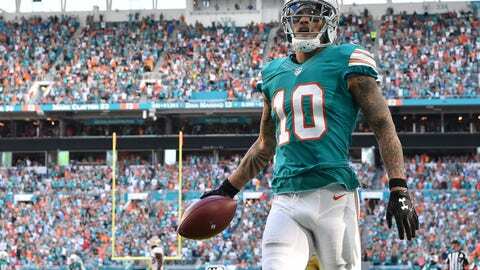 Chief among them, what to do with wide receiver Kenny Stills? I’ve been told to project that Dolphins WR Kenny Stills is in the 5-yr, $30M neighborhood on a new salary, with $12.5M-plus being guarantee. The question that the Miami Dolphins front office is going to be faced with is this: Is what Kenny Stills brings to the Dolphins worth that kind of money? If you ask me, Stills is absolutely worth that price tag. The skills that he brings to the Dolphins extend well beyond the box score. Stills feels like a vital part of a potentially explosive Dolphins offense. In his first season with the Dolphins, Kenny Stills had meager stats, coming down with 27 receptions for 440 yards and three touchdowns. However, in his first season under new head coach Adam Gase, Stills saw his role—and his numbers—expand nicely. This past season, Stills hauled in 42 receptions for 726 yards and nine touchdowns. Anyone who watched Miami this season knows that Stills also left a couple of touchdowns on the field with some drop issues as well, so his numbers could have been even better. Opponents to giving Stills that kind of money will say, “Can you really give that contract to a guy who barely gets 40 receptions?” Yes, you can. The fact of the matter is that someone is going to pay Stills. And it really should be the Dolphins. Stills is an integral piece to Gase’s passing offense. What he brings to the team is completion, and that’s invaluable. The Dolphins wide receiver corps has the potential to be one of the best groups in the entire NFL. Led by all-pro receiver Jarvis Landry, the Dolphins have explosive playmakers at every level of the field. Landry is the premier slot receiver in the NFL, and is absolutely dangerous in the short-to-medium game. He doesn’t have the touchdown capability of counterparts DeVante Parker and Stills, but someone has to get the yards. And that someone is Landry. On the outside, we have the possession receiver with some home run potential in Parker. Parker isn’t the deep, speed receiver that Stills is, but he’s got some big-play potential. And he is far more of a vertical threat than Landry is. But what makes both of these players work is the speed threat the Stills brings. Without the threat of someone who can blow the top off the defense, both Parker and Landry become far less effective. Stills brings to Miami what the Dolphins hoped Mike Wallace would, without the attitude. And at a much more amenable price tag. Perhaps the biggest plus that Kenny Stills has, though, is his age. Coming off of his fourth season in the NFL, Stills is still just 24 years old. He doesn’t have a lot of wear and tear, and will be coming into his prime years. With the production Stills has already put up, and with another year in Gase’s offense, the numbers he could put up are incredible. All this sounds great, right? Signing Kenny Stills should be a no-brainer. The problem is that the number Kelly has thrown out just doesn’t seem right. $30 million feels far too low for someone with Stills skill-set and age combination. Especially in a league that just gave Tavon Austin a contract that exceeds $40 million with nearly $30 million of that guaranteed. That is the contract that sets the market for wide receivers in this coming free agent class. Bringing Kenny Stills back with a five-year contract at just $6 million per year is a slam dunk. But an Austin-esque contract is probably a much more reasonable expectation for Stills on the open market. At that price tag, it becomes a lot more questionable. I still think it would be worth it for the Dolphins to bring Stills back, even at that number. However, it will be interesting to see if the front office agrees, and what direction the Miami Dolphins free agency period goes in.